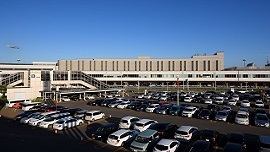 Location Situated near the airport, this hotel is 0.2 mi (0.4 km) from Doraemon Wakuwaku Sky Park and within 3 mi (5 km) of Chitose Outlet Mall Rera and Siam Lock Country Club. Chitose Salmon Aquarium and Chitose Inter Golf Club are also within 6 mi (10 km). Hotel Features A restaurant, self parking, and spa services are available at this hotel. Free buffet breakfast and free WiFi in public areas are also provided. Other amenities include dry cleaning and a 24-hour front desk. Room Amenities All 188 rooms offer free WiFi and free wired Internet, plus refrigerators and LED TVs with digital channels. Free bottled water, hair dryers, and desks are among the other amenities that guests will find. Check-in Check-in time starts at 2 PM Check-in time ends at 5:30 AM Minimum check-in age is 18 Check-out Check-out time is 11 AM Payment types: MasterCard, Diners Club Card, JCB International, American Express, Visa Children and extra beds Children are welcome. Kids stay free! One child 5 years old or younger stays free when using existing bedding. Rollaway/extra beds are not available. Cribs (infant beds) are available for JPY 1500 per night. Pets Pets not allowed You need to know Extra-person charges may apply and vary depending on property policy. Show all policies Fees Optional extras The following fees and deposits are charged by the property at time of service, check-in, or check-out. Self parking fee: JPY 1200 per nightNearby parking fee: JPY 1200 per 24 hoursCrib (infant bed) fee: JPY 1500 per night The above list may not be comprehensive. Fees and deposits may not include tax and are subject to change.